Young, Paul and Duncan, Paul (Ed.). Art Cinema. Taschen, 2009. Earle, David P. The Open Daybook, Random House, 2010. Art Catalogues will be hosting a book release event at the LACMA on Sunday, December 5th, 4 - 6pm. Where The Chocolate Mountains will have its UK premiere this month. Horizontal Boundaries, Painter and Ball 4-14, and Trouble in the Image will screen in London. north side of the river IJ. we are also easily accessible by car. the University of Chicago's Film Studies Center program "Troubling the Image: New & Retrospective Experimental Cinema"
Los Angeles-based artist Pat O’Neill has been making work for the last 50 years, and yet it’s rarely seen in New York. A key figure in West Coast experimental cinema, O’Neill is probably best known for highly plastic and technically accomplished films like his lysergic 7362 (1967) or his extraordinary 35mm feature Water and Power (1989), an experimental documentary concerning, among many things, the development of the Los Angeles Basin from prehistory to the present. 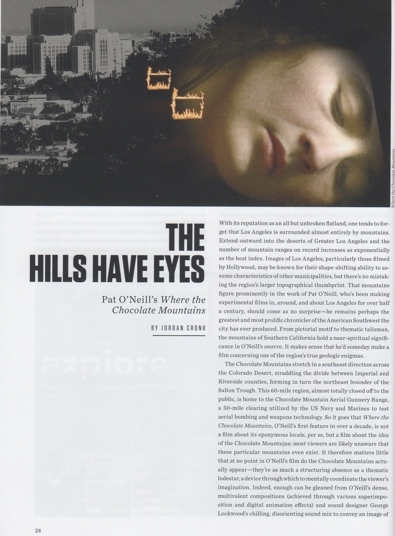 But since the start of his career O’Neill has also been involved in an astonishing range of media—photography, sculpture, collage, and installation, in both commercial and independent spheres. Now in his late seventies, O’Neill is the subject of his first New York solo exhibition, which offers a concise but judicious sampling of his varied output. Comprising twenty-two works on paper, five sculptures, and three moving-image works, “Let’s Make a Sandwich” exhibits both O’Neill’s playful sense of humor and his fascination with diverse materials, images, textures, and technical processes. The visitor most familiar with O’Neill’s film work will recognize his sensibility in the other media immediately, as in the exhibition’s first object: the 2001 sculpture Forney Chair, a red wooden chair with a yellow lacquered cow horn affixed to its seat. Simple as it may be, the piece concisely summarizes all of the hallmarks of O’Neill’s work: bright color, shocking juxtaposition of elements, precise craftsmanship, and a curious tension between found and fabricated materials (other sculptures make use of fur, metal, plastic, and wood). A little further into the exhibition’s somewhat labyrinthine space is Safer than Springtime (1964), a fiberglass, aluminum, and steel sculpture composed of three items: a comically large and phallic green pickle leaning against a yellow-gold cylinder with what looks like a trickle of red liquid seeping from its underside. O’Neill’s collages suggest how his approach contrasts with that of someone like Bruce Conner, a roughly contemporary LA-based artist who worked extensively with both film and sculpture. While Conner’s collage works make use of woodcuts and other imagery to sustain seamless illusionistic dreamscapes, O’Neill’s are messy, making visible their various processes of xerography, Scotch-taping, and erasure. The result—as in a handful of works on paper that bear the title The Deadly Spiral (1978)—resists a sense of uncanny immersion, favoring an awkward harmony that reveals the push-and-pull between O’Neill’s handmade and machinic processes. This obsession with the tensions generated by materials and methods has long made his moving-image pieces difficult to read, even as his extraordinarily detailed work with the cinematic apparatus impresses. (It has also enabled him to work occasionally in the commercial film industry, providing optical effects for feature films as diverse as Sweet Sweetback’s Baadasssss Song and The Empire Strikes Back.) In the exhibition’s title work, the silent three-screen projection Let’s Make a Sandwich (1978-2015), O’Neill constantly layers and montages images and textures in surprising, hallucinogenic, and humorous ways. The “sandwich” of the title seems to pun on the many strata of diverse images O’Neill assembles here: images of concrete being poured, step-printed nature footage, and great swathes of abstraction. Splashes of blue and red obscure images of water and black-and-white instructional films in ways that are palimpsestic, often reminiscent of the add-and-subtract strategies of Lettrist décollage. The 18-minute loop Trouble in the Image (1996), a compilation of shorter films O’Neill made between 1978 and 1995, is a similarly vertiginous catalog of audiovisual materials and associations: observational footage, scratched prints of B-movies, composited landscapes, superimposed bodies, time-lapse photography, and line animation. Accompanied by an equally diverse and disorienting soundtrack provided by George Lockwood, the work is an exhilarating showcase for the artist’s visual ideas and technical mastery that suggests his particular approach to images: as physical materials to be shaped and recombined through re-photographic means. Through his irrepressible exploration of imaging processes and materials placed in volatile relation, O’Neill constantly troubles the image—and our perception of it—enacting strange encounters with their own elements of risk, but also humor and rich, sensual beauty. If computers could dream, Pat O’Neill might be their Sigmund Freud. His multilayered films, sculptures, collages and drawings — in a mesmerizing mini-survey at Cherry and Martin — seem to be made from the deleted files, trashed photos and lost messages that are beyond the reach of our phones and notebooks but still out there in the ether, with the capacity to come back to haunt us, sometimes savagely. Think of O’Neill’s exhibition as the digital unconscious in action. That puts you well on your way to understanding what he’s up to as an artist and why his work is so important. As a whole, the show is a stimulating stew of stuff, a hodgepodge of snippets and fragments and unresolved relationships. Its mess of non sequiturs has a vividness and intensity that charge every element with a potent jolt of energy while never settling into a story line that lets you think you’re over and done with it. If you like your art cut and dried and easily summarized, you’ll find nothing but frustration in O’Neill’s, which is all about loose ends, rough edges and patterns bigger than any of us. In the first gallery, an old-fashioned slideshow that O’Neill made this year introduces visitors to his way of working. Its three projectors are all aimed at the same spot on the wall so that the pictures and texts they project produce a single image that changes, sometimes abruptly, with the clunk of the 35-millimeter slide dropping into place, and sometimes subtly, with a fader mechanism softening the transition. The story that unfolds has the intangibility of daydreams, the resonance of memories and the atmosphere of homemade documentaries. Its rhythm and structure are integral to its effect. Like the weather, it can’t be compartmentalized or taken out of context. Two small drawings, titled “Surfing the Mohave” and “A Drawing With Oxycodone, Coffee, and Autocritique,” similarly slam disparate realities into cramped quarters. The porous borders between fact and fiction — as well as the disruptiveness of inconvenient truths — take potent form. In the main gallery, two sculptures from the 1960s, two films from the ’70s and six framed works on paper from the ’70s, ’80s and ’90s show O’Neill at his best, piling up pictures, superimposing scenes and interrupting images (and objects) by playing fast and loose with the frames of reference we bring to things. Even his sculptures, whose solidity should be reassuring, seem to be on the move. “Black Sweep” appears to be spinning swiftly, like a reincarnated piece of Italian Futurism. “White Double Sweep” looks as if it’s sinking into the pedestal it rests on, like a magic trick gone wrong. O’Neill’s films form the show’s heart and soul. “Saugus Series” and “Two Sweeps” throw so many monkey wrenches into a visitor’s perceptual machinery that some kind of repair seems to be needed. That’s not a bad situation in which to find yourself, especially when O’Neill is on hand. His sensitivity and insight make room for viewers to have our own.